New Kerr County History Book Available! photo taken last year. Click on any image below to enlarge. One of the more interesting buildings in town is owned by the Voelkel family, and is the home of their company, Voelkel Engineering. The building is located at the intersection of Water and Clay streets, just across Clay Street from the city's parking building, and what makes it interesting is its shape: when looked at from above, the building is the shape of a right triangle, snugly fitting onto its uniquely-shaped lot. 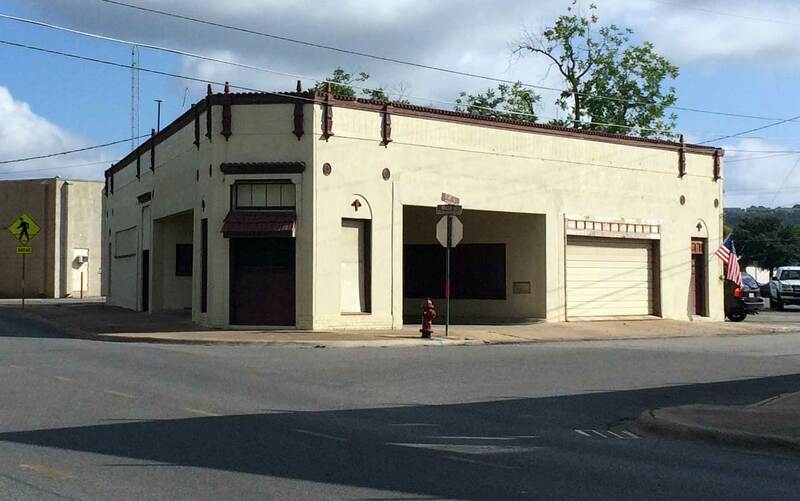 We don't have a lot of buildings with a triangle-shaped footprint in Kerrville. A close look at the building reveals its many special features, from the Spanish-style tiles along its roof and above its windows, to the little plaster finials at each angle of the triangle, to the decorative reliefs above the windows and doorways. Years ago I wrote a story about the building, identifying it as the showroom of the Cone Car Company, which was the Ford dealer years ago. Not so, said several readers; in their memory the building was Cone's service department or gas station. The Cone showroom was on Water Street they told me, opposite the parking lot between our print shop and the A. C. and Myrtle Schreiner home next to the library. I deferred to those readers since several were around when the building was built, in 1926. My earliest memories of the building date from the mid-1960s, when the building housed the Sweatt Cleaners, a dry cleaning company. Besides, photographic evidence suggested those readers were correct. 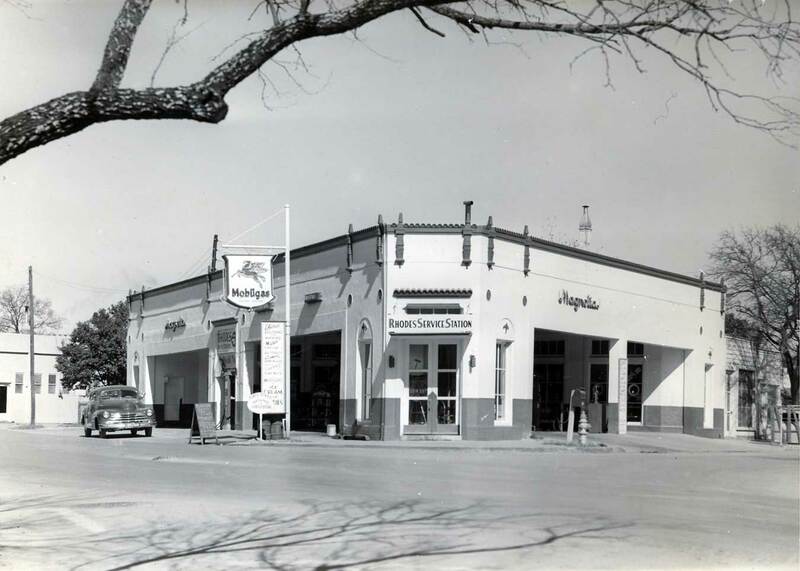 I have a 1950s photo of the building when it housed the Rhodes Service Station, which sold Magnolia products. The photo shows a big neon sign for "Mobilgas," complete with a flying Pegasus. 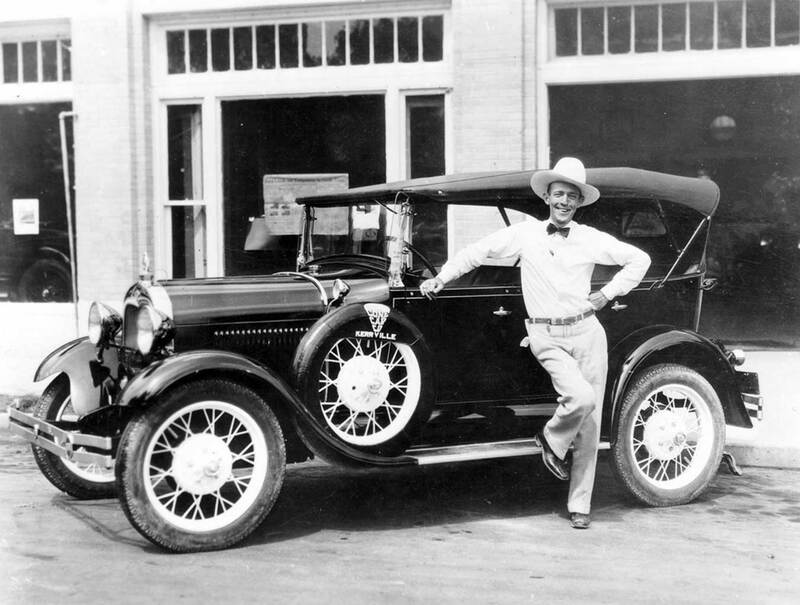 Another photo, showing Jimmie Rodgers standing next to a new car, appears to be taken on Water Street, implying the showroom was there, and not on the corner. 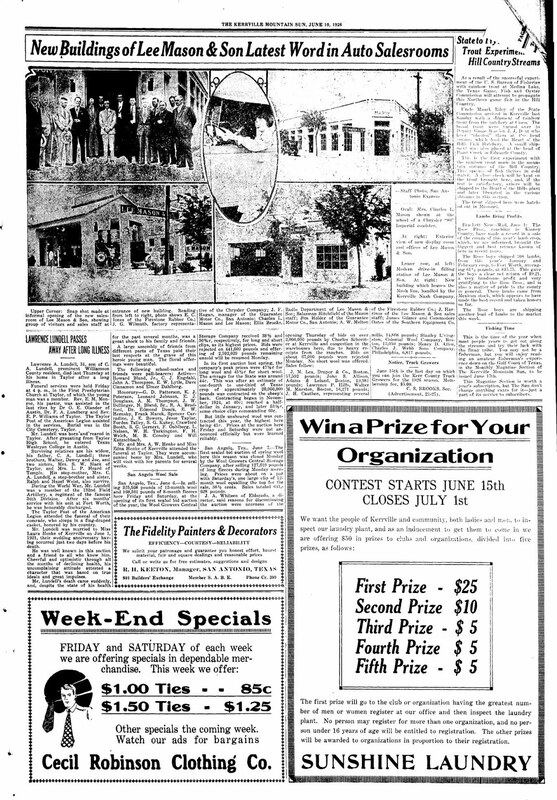 Michael Bowlin, my friend and fellow history detective, recently found a news item in the June 10, 1926 issue of the Kerrville Mountain Sun, which shows the Voelkel's building, and which helps solve the mystery. "New Buildings of Lee Mason & Son Latest Word in Auto Salesrooms," the headline reads, over a cut of photographs labeled "Staff Photo, San Antonio Express." The Voelkel's building is shown in two of the five photographs; one, with a group of men standing at the building's sharpest corner, facing Water Street; the other was taken across Water Street facing the building. "Exterior view of the new display room and offices of Lee Mason & Son," the caption reads. A close look at the grainy photograph shows the building lacked the large drive-through openings featured on the building today. A long row of windows lines the Water Street and the Clay Street sides of the building. The building was designed by Adams & Adams, architects from San Antonio, the same firm which designed the 1919 facade of the Schreiner Building. Lee Mason & Son were dealers for several lines of automobiles, including Ford automobiles and tractors, Nash automobiles, and later Chrysler products. Founded in 1915, Lee Mason and his son Charles were successful in their several businesses, which included the dealership, a garage, and a filling station, which was across Clay Street, where the corner of the parking building stands today. The business continued during World War I, while Charles Mason fought in France. In 1925, they sold their Ford dealership to G. S. Cone, who had been in Kerrville for sixteen months, having moved here "seeking health." Cone had previously had a Ford dealership in San Augustine. The Masons built the triangle-shaped building in 1926 for their Chrysler dealership. So my readers were correct: the Cone Car Company showroom was on Water Street, where Cone sold Fords; the Lee Mason & Son showroom was at the corner of Water and Clay streets where the Masons sold Chryslers. Later, by the 1950s, the triangle-shaped building was remodeled into a gas station, with the wide drive-through openings replacing the series of windows and doors. In the 1960s the building was a dry-cleaners, and most recently has been a part of Voelkel Engineering. It's served many businesses in its 93 year history. Until next week, all the best. 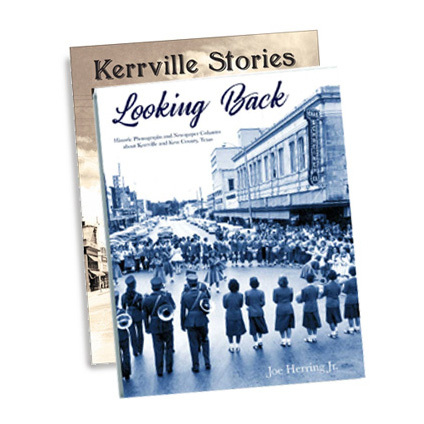 Joe Herring Jr. is a Kerrville native who walks by the Voelkel's building most weekday mornings with his sister and son. This column originally appeared in the Kerrville Daily Times March 23, 2019. Click here for FREE shipping. Wow! Thanks for all of the book orders last week. My latest book is still available at Wolfmueller's Books, Herring Printing Company, and online, by clicking HERE. Thanks for your support. Never miss a story from Joe. Join today for FREE. Please remember this is a rated "family" blog. Anything worse than a "PG" rated comment will not be posted. Grandmas and their grandkids read this, so please, be considerate. 1967 Kerrville Fishing Rodeo: how many of these kids do you recognize? © 2018 by Joe Herring Jr. Watermark theme. Powered by Blogger.